Happy New Year! Time for my thoughts on the past year; I will cover the year ahead in another post. 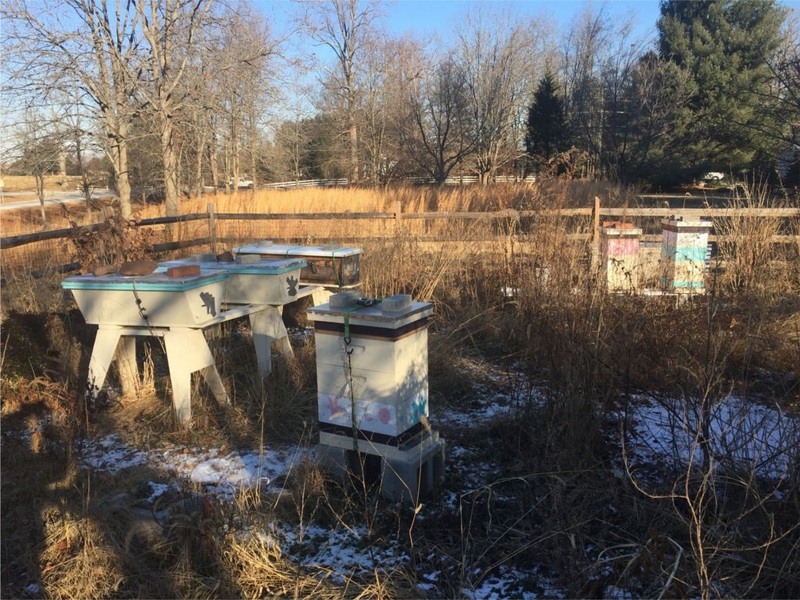 Most situations can always be better or worse, and my beekeeping in 2017 was no exception. It is bitterly cold by our standards in the U.S. right now, so a fine time to curl up in my favorite chair and think about bees. Here is my report card based on last year’s post with my goals for 2017. Last year I gave myself a C+ for my 2016 efforts. Let’s see how we did in 2017. I did this! In the spring I moved some combs from Saturn into my new top bar hive, which resulted in the hive Titan. The bees created a new queen and the hive will hopefully survive into this coming spring. I did this too! Mars gave up a single medium super to yield over 40 small jars of honey. I have been giving it away all winter, much to the delight of my friends and family. Not the greatest harvest, but the goal was met. The plan was to use my medium-sized nucleus hive, and consider building a top bar hive nuc. I did not use my medium nuc, and while I did build some top bar nucs I did not actually use them. I did, however, create and sell some nucs. I did this in cardboard nuc boxes, which turned out to be a bad idea as they don’t hold up well for multiple weeks. My woodworker father made me some plywood nuc boxes for the coming year, which will be the subject of a future post. Mixed results on this one. While the bees created queens for the new hives and nucs, I had very little to do with it. I was hoping to raise queens from my hive Saturn. Instead it was Ganymede, a more aggressive hive, that produced a number of swarm cells. Her offspring have been much more gentle, though, and worked out rather well. Beekeeping is often about timing. The right actions at the right time will discourage swarming, allow more nectar to be harvested, and encourage stores for winter. In my apiary, basically every hive swarmed, which probably reduced the amount of nectar collected, and the hives were a bit weak heading into winter. I expect to lose one or two hives before spring, especially with our current cold weather. The grades are made up and the points don’t matter. Still, on a four-point scale (A is 4, F is 0), I would have 16 points for five goals. So my 2017 grade point average (GPA) is 3.2, a solid B. Up from that C in 2016, while still leaving some room for improvement. Of course, beekeeping is a multi-year affair. I have six hives overwintering at the moment; we will see how they are doing come spring. This 2012 documentary is about the decline of honey bees worldwide. It is an interesting film with fantastic photography, and worth watching if you have not seen it. There is an official movie site if you would like to learn more. The movie does a good job highlighting society’s dependence on pollination services for the bulk of our food. Even vegetarians and vegans, not to mention pescatarians, have a heavy dependence on honey bees for their fruits and vegetables. Recent research has additionally highlighted the need for other native pollinators such as bumblebees and mason bees as well. The decline of bees, especially wild bees, is likely caused by a combination of factors. Our reliance on large-scale agriculture practices, including the use of pesticides, is a big factor. Another major factor is our obsession with grass-only lawns. If you leave a section of your lawn for wild flowers, or carve out a small plot for native or other pollinator-friendly plants, the bees will appreciate it. That’s a good point! I had not thought of that. Hope you have a happy and productive 2018.